Bad Kleinkirchheim is a spa town and winter sports resort in Carinthia, Austria. The village has been called ‘the birthplace of spa’ culture - its first recorded mention was way back in 1177. The best places to stay in Bad Kleinkirchheim are ideal for both skiers or for those looking for a restorative break. The initial attraction of the town was the crypt under the Kathrein Kirchlein Chapel which housed the first thermal spring (dedicated to St. Catherine). This drew pilgrims from far and wide as the Augenquelle spring water was noted for its anti inflammatory properties. In the seventeenth century a second spring was discovered which led to an increase in visitors. Bad Kleinkirchheim became a very popular spa destination from the mid-nineteenth century and remains so to this day. In 2005 the Thermal Romerbad was opened - with 13 saunas - a state of the art spa designed by architect Gunter Behnisch (of Munich stadium fame), which is not to be missed. Aside from the healthgiving waters, Bad Kleinkirchheim has grown since the 1950’s as a popular ski resort. Franz Klammer won his first Europacup downhill here in 1971, and it has hosted many events on the World Cup circuit since. There are now over 100 kilometres of piste to enjoy, with runs for all from beginner to expert. The Thermal Romerbad has 13 saunas and is the ultimate place of relaxation in the Austrian Alps! Bad Kleinkirchheim is the perfect place for all skiers, with everything from beginner areas to expert black runs! The best places to stay in Bad Kleinkirchheim are especially busy during the peak winter months. So if you want to be sure of a room, get organised and book early. 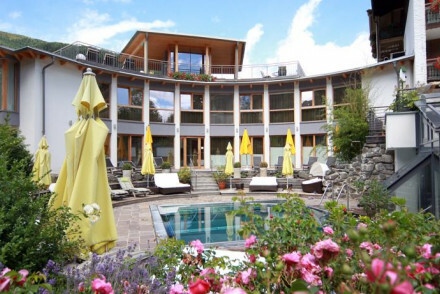 Hotel Eschenhof is an ideal four star family hotel close to the ski lifts. The feel is light and airy and the atmosphere laid back. Plus there's a great spa for relaxing and easing weary limbs after an energetic day on the slopes. 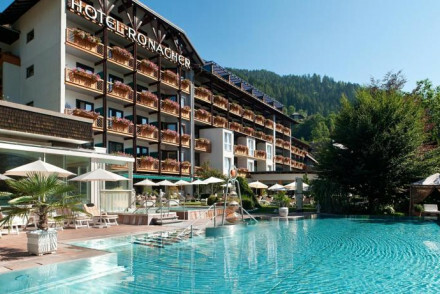 Thermenhotel Ronacher is a deluxe hotel combining the ultimate spa experience with a perfect situation and amazing views - not to mention gourmet dining. The are an abundance of activities to enjoy or you can simply relax and be pampered in a lovely environment. Bad Kleinkirchheim's nearest airports are Ljubljana (80 mins away) and Salzburg (2 hours away). Winter is the most popular time of year here, with over 100km of piste to enjoy during the season. However, Bad Kleinkirchheim is also renowned for being a lovely spa town for relaxation. In the summer, as with the majority of the alps, the ski piste turn in to excellent hiking and mountain biking areas. A family friendly 4 star hotel within easy access from the ski lifts. Light and airy rooms with neutral tones and large windows. Healthy food served in the restaurant following the principles of Slow Food. An indulgent spa for post-activity relaxation. A great choice for active family holidays. Skiing - Over 100 kilometres of diverse slopes waiting to be explored, plus the hotel provides ski storage and ski-to-door- access. Families - A laid-back atmosphere and plenty of activities in and out of the hotel, as well as kids club, babysitting and kids menus. Great walks - The guided hiking tours through the Nockberge Mountains are fascinating. Kayaking - Glide across one of the many lakes in the area. An indulgent hotel and resort with stunning mountain views. Well appointed, large, rooms with floor to ceiling windows. A number of gourmet restaurants including a wellness restaurant and panoramic restaurant. A glorious spa and thermal pools plus an abundance of outdoor pursuits. A spoiling stay. Spa breaks - The hotel boasts an extensive spa with five different theraputic thermal pools, bio sauna, steam bath and meditation areas. Active Holiday - Alpine activities in abundance from skiing to hiking and everything inbetween. A real adventurers paradise.